In every area of gastronomy where mass quantities of beer of consistent quality are passed across the bar, ultimately one factor plays the biggest role: time. Until now, even the world’s top bartenders rarely poured more than one small beer in about 11 seconds. Poured? Yep, poured! Because this type of dispensing is history. Beerjet is the future. BEERJET CAN DO WHAT NO OTHERS CAN. What is Beerjet? In a word: innovation. An innovative fully automated dispensing system that can pour six half-litre beers in seven seconds—five-and-a-half times faster than conventional hand-operated tap dispensers. What’s more, it’s always the same quality. Always the same speed. And always the same volume per serving. From a glass mug to a single-use cup, from 0.2 litre glasses to a whole litre. And all that—at the touch of a button. Patented and absolutely unique in the global market. BEERJET IS THE RIGHT CHOICE—FOR WHOM? Beerjet excels wherever beer is the first-choice thirst quencher. Whether as a fixed installation in major stadiums and breweries, or temporarily installed at events, no matter if it’s a sport venue, music festival, or fair. The greater the number of guests, the better can Beerjet’s strengths be fully leveraged. 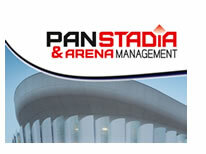 In this informative article within Panstadia & Arena Management, Beerjet's Joe Hague highlights the recent UK Beerjet success. Already in operation in stadiums throughout Europe, Joe discusses how successfully trials at sporting venues like Wembley Stadium, Race courses and other popular sporting venues, are driving down queues, driving up sales and contributing to an improved visitor experience. 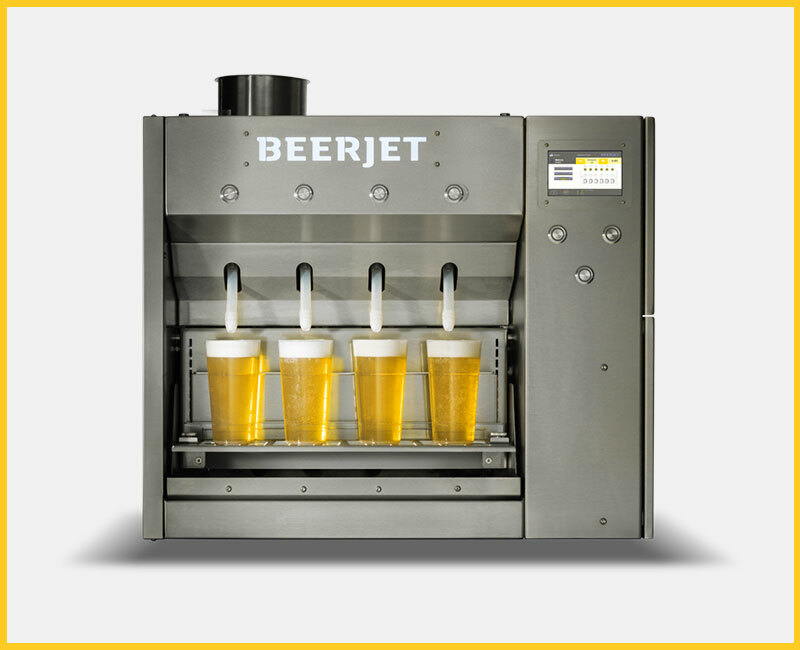 "When thirsty crowds come in, then Beerjet really shows its power, you will be pouring faster than your customers can drink"
Beerjet can pour up to 1,000 beers per hour. Its fully automated operation dispenses up to six beers at a time. In containers with a capacity of 0.2 to 1.0 litres. For single-use and reusable cups or glass mugs. Adjustable pouring speed and foam volume. Works with ALL types of glasses. Perfect foam thanks to integrated foam button. Automated cleaning at the touch of a button. Variable authorisations for administrators, operators, or technicians. Seamless protocol for all processes. Because Beerjet cuts the wait – no matter how big the crowds. And as we all know: your patrons would much rather be drinking their beer than waiting for it. Overpouring? Not a chance! With Beerjet, you tap precisely as much beer as indicated by the setting. And that applies to each individual serving. Instead of pouring themselves, your employees can take better care of your clients at the same time– and drum up additional sales. 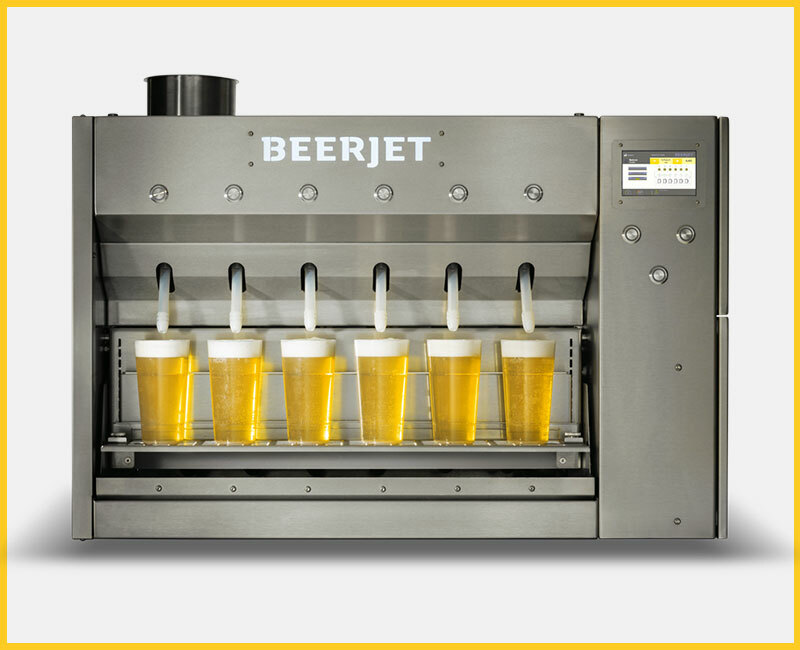 Beerjet records each serving automatically in the system, including the foam button. That makes it easier to keep an immediate check on costs. Working with Beerjet is so simple that you need virtually no prior experience. All of your employees can operate it at the blink of an eye. The automated self-cleaning operation is more than just easy: it also complies with hygiene regulations and ensures consistently excellent beer quality. With four spouts, the Beerjet 4 is ideal for fixed installation in stadiums and arenas. An expanded model with six spouts, the Beerjet 6 deserves a permanent place in any entertainment facility. 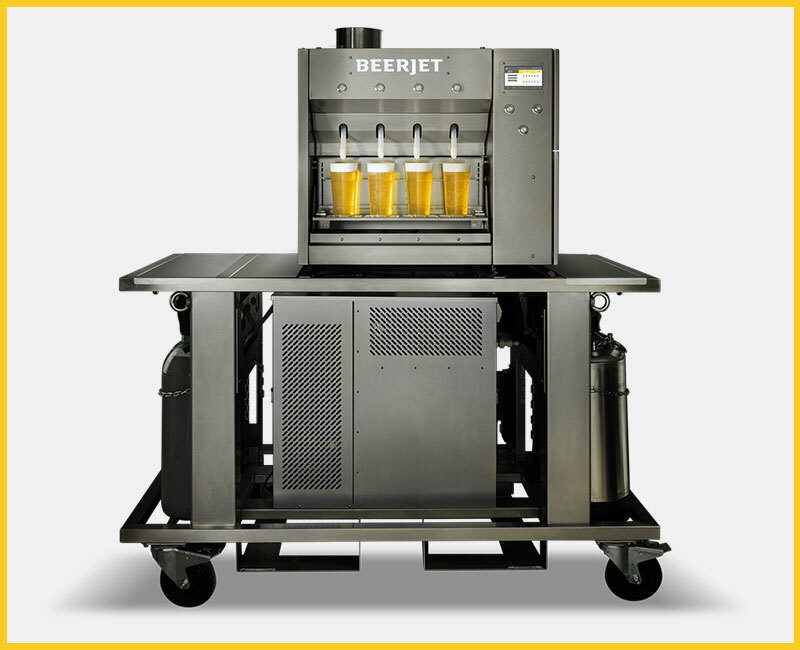 Keep your beer distribution moving with the portable Beerjet 4 Mobile unit. 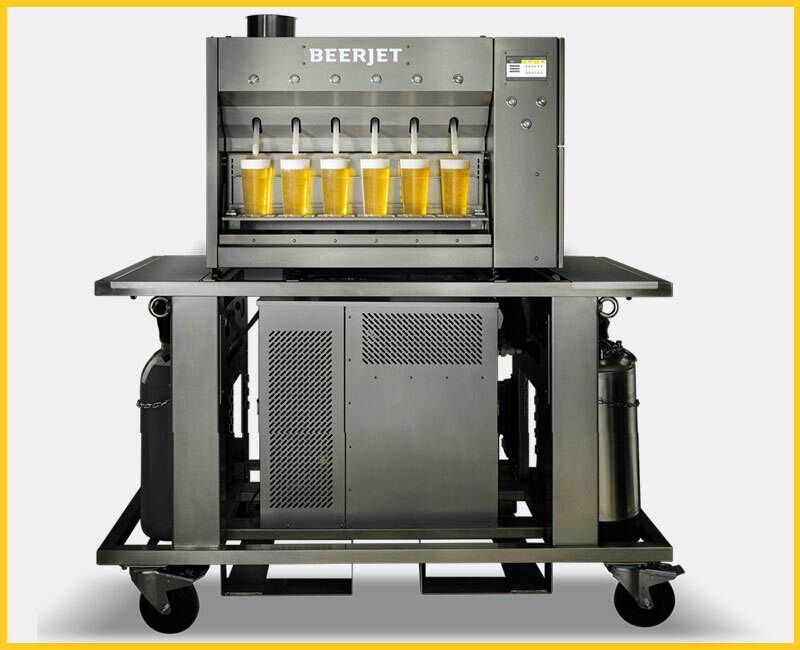 With mobile capabilities, the Beerjet 6 Mobile can meet beer needs at festivals, concerts, and more.